What would you tell your grandmother you do for work? Upon great reflection, I am pleased to tell the world, I am not a knowledge management consultant. I promise to continue working, keep doing what I do and most of all, I promise to change my title. 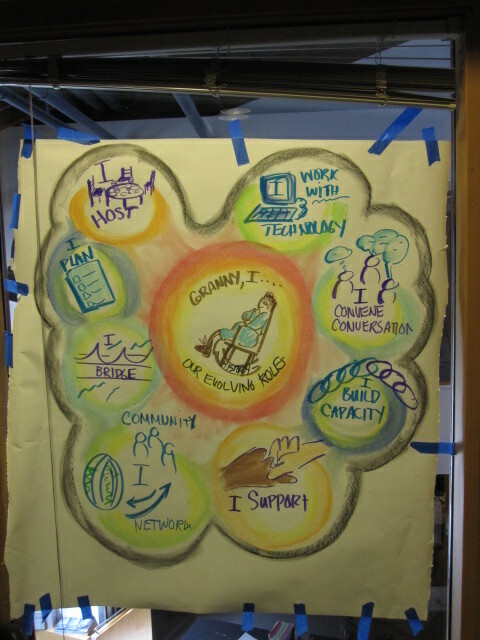 The graphic to the left illustrates a conversation at a recent meeting of online community enthusiasts (drawing by Nancy White). We were asked to describe what we do for work to our grandmothers. The answer that resonated with me most was telling your grandmother that you were a host. For example, next time someone asks me what I do, I might tell them, what I do is similar to hosting a fantastic party. I plan the party including the appropriate food, ambiance and people. I do my best to ensure that conversations are interesting and everyone has a chance to talk and listen to everyone else. I try to make it interesting and enjoy it when people have a good time. Ideally, people leave the party with new ideas, new ways of thinking and plans for exciting activities they can do in the future. It needs a little work however I am quite sure this is not knowledge management. A few years ago, when I worked for an international organization, my title was knowledge management (KM) officer. When moving to BC and taking up work as a consultant, I decided that KM would be my consultant title. I now believe this was an inappropriate appropriation for me. The difference is scale. In large institutions, KM in its formal sense is necessary as experiences are taking place across the globe, from the field level all the way to the United Nations. Finding ways to bridge hundreds of experiences, document key learnings and integrate lessons into policies for change is at the heart of KM. In smaller environments, I suggest that bringing people into the same room, offering a meal and a chance to take the time to share, reflect and learn is somewhat similar. The difference in my new environments is that we aren’t trying to manage things…. its about collaboration, learning and action. So as I think about creating a new title, I reflect on what my work entails. Mostly I manage complex community based projects. However, within those projects, I aim to create environments for people to come together to learn, collaborate and integrate improved methods into their work. My background is in sustainable development so often that is the underlying theme but its not necessary. Given I live in a very small region, diversity is a strength so I won’t try to put my new title into a box just yet. For now, I will try the title of “host”. Yesterday I met with a group of people who identify as Online Community Enthusiasts. 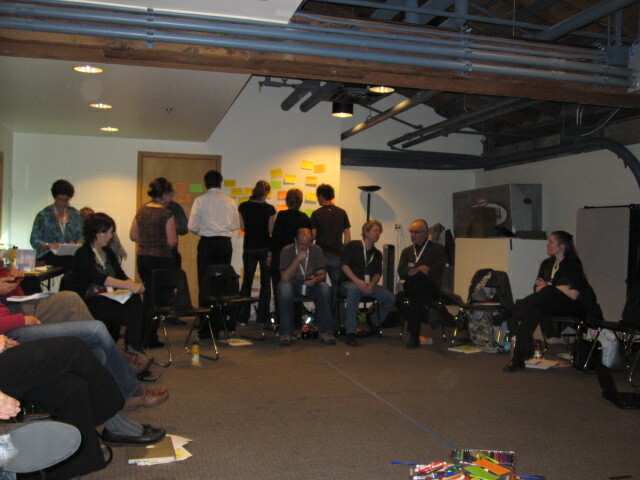 Something that resonated with me was the use of metaphors to talk about complex topics. Examples included the Intellectual Estuary to describe a place where you bring different minds together to share ideas or Intersections to describe a place where groups find mutualism and agree to work together more. I am a strong supporter of Eddys and will use this metaphor when trying to explain the value of reflective practice to project managers in the future. Thanks to the online enthusiasts for all the great conversations throughout the day!